My 52 centuries a year quest was stopped by an injury to my left leg so I was only able to complete 46 centuries this year. Hopefully, I’ll be back on the bike soon. On nearly all my rides I capture the route on my GPS (currently an Edge 705) and I take pictures of the participants and a few scenery shots. Most of the albums are at my Picasa albums page but some are in the Almaden Cycle Touring club gallery on SmugMug. #46 on 14-Nov – Part of the Hollister Permanent with Ken Emerson. Photos of this 119-mile ride at this link. 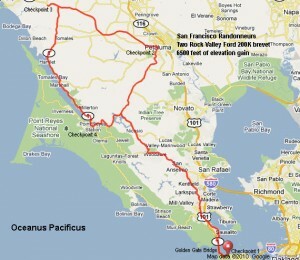 #45 on 30-Oct – Old Tierra Bella – 105 miles led by yours truly. Photos at this link. # 44 on 23-Oct – Skyline Ramble 200K – 125 miles with my good buddy, Ken Emerson. This is the 11th month in a row where Ken is riding a randonneuring event toward his R-12 Award. I’m happy I was able to accompany him on part of his journey. And this only represents about 25% of his riding for the year. This ride started in Santa Cruz went to Freedom up to Los Gatos through Corralitos then up to Skylonda for lunch followed by a screaming descent down Hwy 84 to San Gregorio. 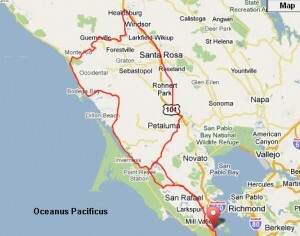 From there it rained all the way back south to Santa Cruz as we rode through Pescadero and Davenport. There weren’t many other cyclists out there but we did run into Andrea Symons as she was heading north just outside Pescadero on the Pizza Century. I only took a few photos due to all the rain. After a great Solvang Century in 20 08 I thought I could make an even better go of it. In 2008 I completed the ride in 6 hours, 30 minutes; 5:50 in the saddle. A combination of less power in my legs this year and strong headwinds it took me over 7 hours total time and 6:18 in the saddle. Shows I need to rev up the training rides as much as I have the distance rides. After I failed to complete the Devil Mountain Double back in 2007 I decided that super long rides were not for me. So, the 300K (188 miles) seemed out of the question but I’ve been doing so well this year with distances up to 150 miles that I felt like the 300K would be tough but doable. And there’s something different about the brevets, at least for me. There seems to be so much comradarie among the riders than on other organized rides. In the past, I would start getting frustrated after about mile 120 and mad at myself after about mile 150 for signing up for such a distance. Saturday, I never felt that way. It was a great day. This was almost a no-go for me since it had been raining all night and most of the drive up to the Golden Gate Bridge. (I hate riding in the rain). The rain subsided just long enough for the 83 riders to register. And then it rained for the next few hours, all the way up to Petaluma. We were soaked by the time we arrived at the first check point on the road. I hate that! Back to the beginning…as usual I didn’t sleep well the night before a big ride and the sleep was disturbed by rain pounding on our house. I couldn’t stop imagining myself soaking wet on the bike. Time finally came for me to drive over to Ken’s house so we could load the bikes into his big white van…at 5AM!! We parked at Crissy Field at 6:15 in time for registration at 6:45 and launch at 7:00. While waiting for launch, Ken checked out Barley’s fancy little fixie. I can’t believe he can ride something like that and keep up with people on real bikes. Barley is the man.